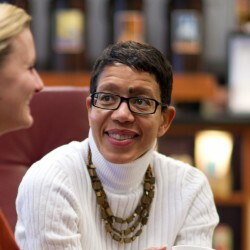 Lynne Edwards is a Professor of Media and Communication Studies at Ursinus College. She is the author of “Slaying in Black and White: Kendra as Tragic Mulatta in Buffy the Vampire Slayer” in Fighting the Forces: Essays on the Meaning of Buffy the Vampire Slayer, Rhonda Wilcox and David Lavery, editors (Rowman & Littlefield, 2002), and co-editor of the anthology Buffy Goes Dark: Essays on the Final Two Seasons of Buffy the Vampire Slayer on Television, with James South and Elizabeth Rambo (McFarland Publishers, 2008). Dr. Edwards has published youth media-based research including “Black Like Me: Value Commitment and Television Viewing Preferences of U.S. Black Teenage Girls” in Black Marks: Minority Ethnic Audiences and Media, Karen Ross, editor (Ashgate, 2001). Currently, Dr. Edwards is the co-PI on a three-year, $498,000 grant from the National Science Foundation to study and prevent cyber-bullying and cyber-predation. From this work she recently co-authored “ChatCoder: Toward the Tracking and Categorization of Internet Predators,” with Dr. April Kontostathis and Amanda Leatherman, (UC ’09) in Proc. Text Mining Workshop 2009, held in conjunction with the Ninth SIAM International Conference on Data Mining (SDM 2009).